UPDATE: I’ve updated this post as of 2013-09-21. I’ve removed parts about the IBM M1015 and focused more on the Dell H310 and H200. I’ve also updated some of the links and added steps for flashing to the LSI P17 firmware from the Dell 6Gbps SAS HBA firmware which I highly recommend. I just wanted to go through a few things I found while trying to flash IT firmware to my Dell Perc H310. 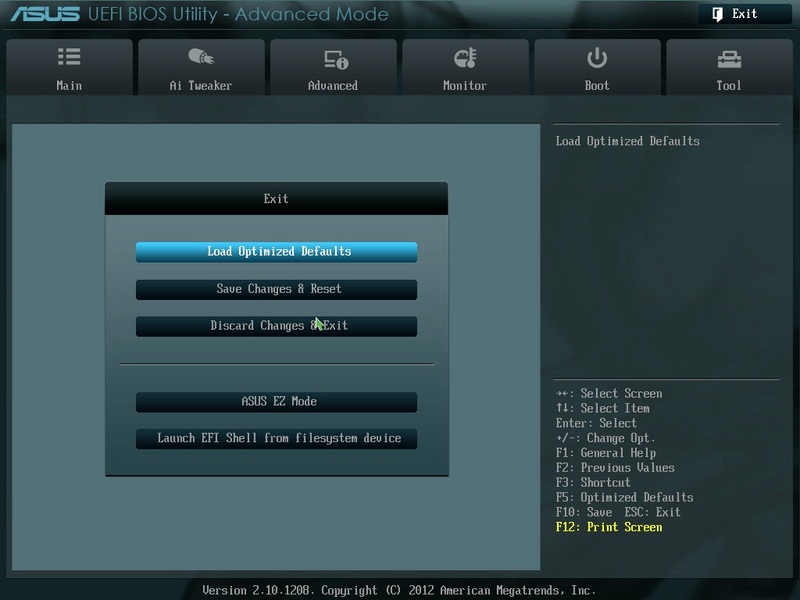 This process is pretty well documented on various sites and forums for users that have an older motherboard with a typical BIOS. 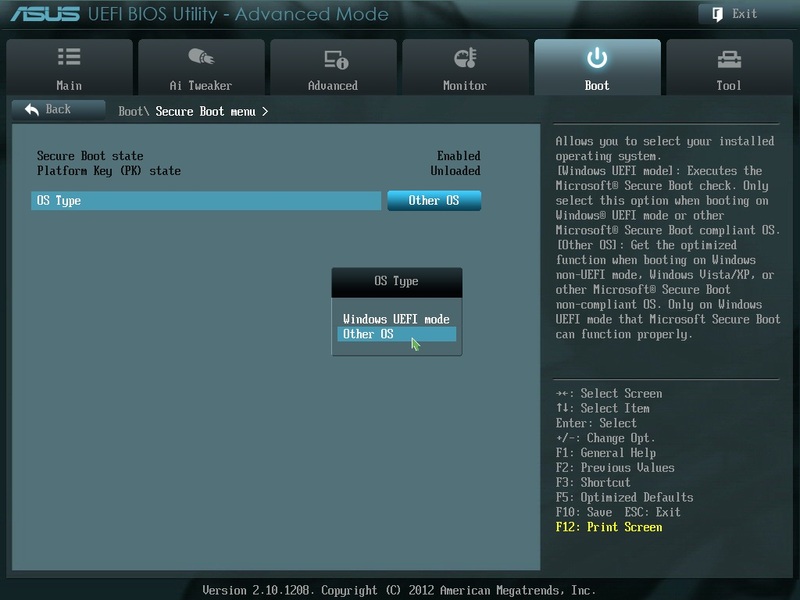 For users like myself who only had newer motherboards with UEFI it gets a little tricky. All of the information you need is out there but I had a hard time finding it in one place and with the detail needed to not fumble through the process. So let’s get down to what we’re going to need. This should already be included in the LSI-9211-8i.zip I’ve provided in the next link. 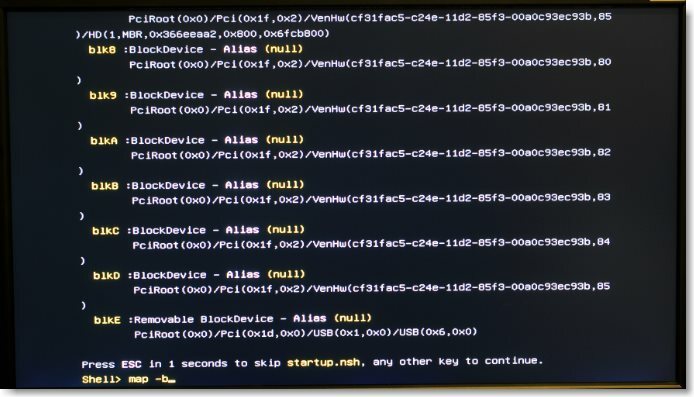 Once you’ve created the bootable USB drive in step 1 you want to copy the contents of sLSI-9211-8i.zip onto the USB drive. 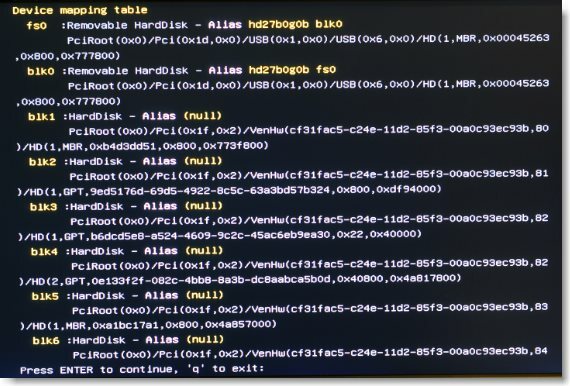 With the bootable USB drive inserted (may work best in a USB port on the back of the computer) a reboot may boot directly into the USB drive. If not you will need to select the drive from a boot menu. This will be different for every motherboard but should be similar. To save the SAS Address we’ll need to use sas2flsh. sas2flsh -o -sasadd 500xxxxxxxxxxxxx (replace this address with the one you wrote down in the first steps). Reboot the computer back into Windows. (If you’re using Windows) You may need to remove the USB drive. 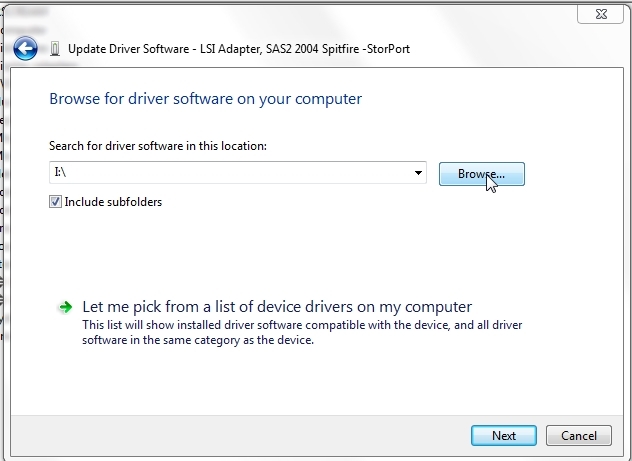 In Windows make sure you’re using the LSI StorPort driver. 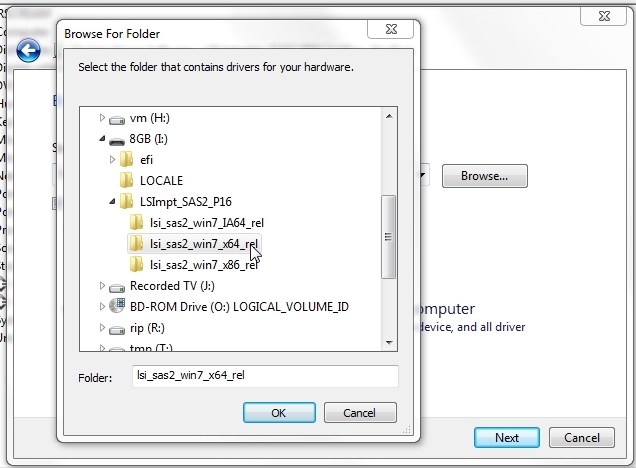 Browse to your USB drive and expand LSImpt_SAS2_P16 and select either the x64 or x86 folder depending on your OS. 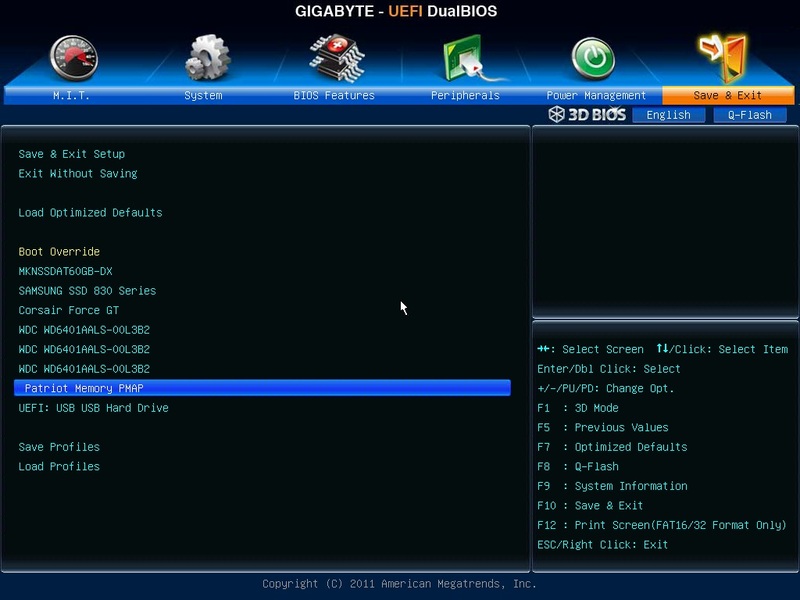 Now if you have a UEFI motherboard and received an error like this: "ERROR: Failed to initialize PAL. Exiting program." when trying to run sas2flsh then you’re going to need to run the flashing steps in an efi shell. All of the other instructions should work fine. When you reboot after running megarec -cleanflash 0 is when you’ll need to enter the efi shell. As noted above for the H200 cards you will need to run sas2flash from the UEFI shell in order to save the SAS Address. See step 30 for the commands to view the SAS Address. After the megarec -cleanflash 0 completes instead of rebooting into the USB drive we’ll want to reboot into the UEFI shell. sas2flash.efi -o -sasadd 500xxxxxxxxxxxxx (replace this address with the one you wrote down in the first steps). If the steps for flashing the 2118it.bin do not work you can try a couple different methods. Try flashing the 2118p7.bin first and then flashing the 2118it.bin. Try flashing with the sas2flash-x64-p7 or sas2flash-x86-p7 in an elevated command prompt in Windows. At this point when you reboot you should not see any information about the card during POST and you shouldn’t need any drivers for the OS in order for the card to function. I still recommend making sure you’re running the LSI StorPort driver. You can also reach me via PM on AVS Forum as techmattr or ServeTheHome Forums as just mattr. thanks for the tips here ! B5 B6 helped me a lot ! 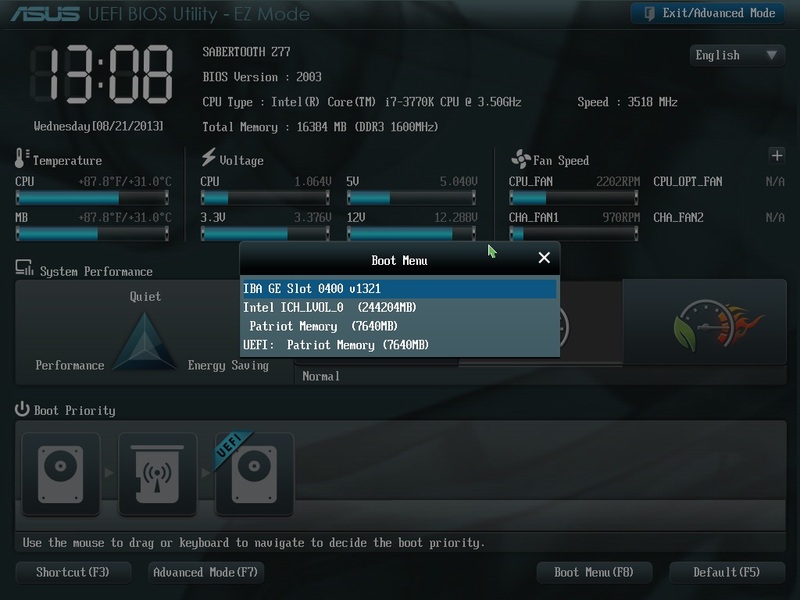 On my motherboard (Asus Rampage III Extreme, X58), inserting a reflashed (IT) Dell Perc H310 disables memory slot B1. So at least one DIMM is “lost” and the system memory count goes down. Taping over pins B5/B6 solves the problem. I have two cards flashed with this method and they only detect one drive (out of 5 plugged in), what can be causing this? I also stopped at the 6GBSASHBA step as trying to flash 2118it.bin resulted in “cannot flash from IR to IT” (or something similar). Are you sure you have the right cable? I’ve seen that happen when people use a reverse breakout cable instead of a forward breakout cable. Also, what OS? I assume you’re using a UEFI motherboard? The sas2flash utility hasn’t been completely ironed out for the UEFI flash from 6GbpsSASHBA firmware to 2118it firmware. I’m still searching for a better version of sas2flash. I also did sas2flash.efi -o -e 7 at one point to try to get past a “Failed to Validate Mfg Page 2” error. 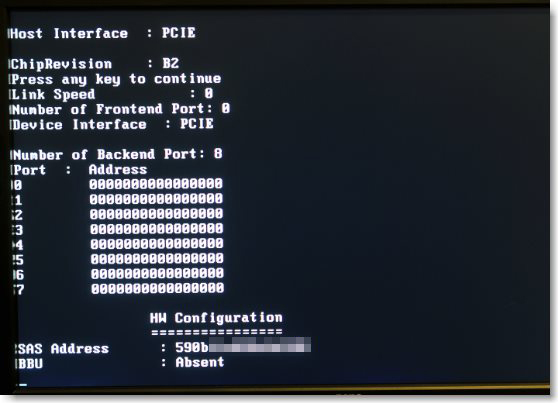 If you try this, make sure to first get your SAS address, and afterwards DO NOT REBOOT until you successfully flash *some* firmware to your card. After I ran the -e 7, I was unable to flash a firmware until I did sas2flash.efi -list. Then I could flash 6BGSAS.FW, and finally (using mattr’s sas2flash.efi) 2118it.bin. I don’t know if the -e 7 thing is needed. The critical thing is to use mattr’s ss2flash.efi and not the P19 one. Good luck! Many thanks to mattr!!! The erase command is essentially doing the same thing as the cleanflash. Though cleanflash is more equivalent to doing a level 6 erase. A level 7 erase wipes everything including the mfg area. This doesn’t help in our flashing process though as the mfg is still on the card. It’s just not in the flash area. Our workaround is flashing the Dell 6Gbps SAS HBA firmware to trick sas2flash into thinking it’s a rebranded OEM LSI. mattr, thanks for clarification, and again for your excellent firmware zip and this site. Getting LSI IT on the H310 was a big pain even with your help. I’m not sure I’d have managed without. No problem! I’m glad you found it helpful. Writing Current Mfg Page 2 Settings to NVRAM. Failed to Validate Mfg Page 2! This is usually from not wiping the card. Were you able to successfully execute the cleanflash command? I did. I even tried to use the megarec command outside of the bat commands. It’s odd because i see a lot of people are having success. Any good ideas how to convert an IT firmware flashed H310 back to its original state as a H310 PERC raid controller? I’m actually about to write up a tutorial on this exact topic. The simplest answer though is to just follow the same steps but with the H310 firmware. I haven’t done this in a while though and I can’t remember if there were any hangups. Hopefully I’ll have some time tonight to go through the process again and write something up. I’ve been fighting with this for a couple weeks now, and I figured I’d give everyone a rundown on how this experience panned out. I’m going to leave out all the crap that didn’t work. To start, I have an H200 rev.B2 card. I think the revision is an important part of what works and what doesn’t for people. 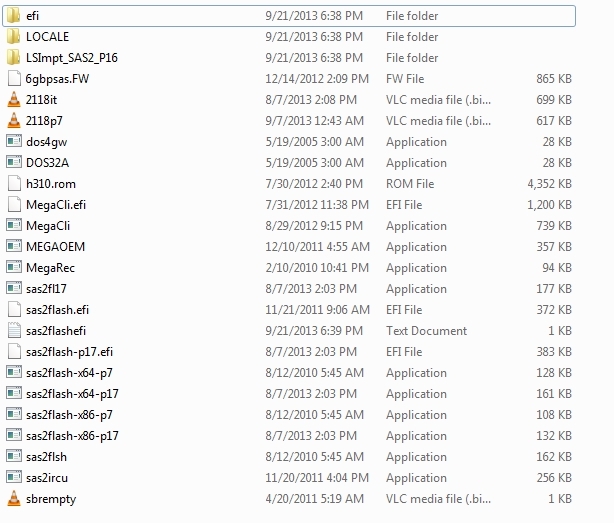 To start, I downloaded the tools zip file from here and pulled some specific files from it. I also used the p12 version of Sas2flsh.exe. I collected as many releases of this as I could find, and only p12 worked for me to put on the LSI firmware, though P15 did work for changing from RAID to HBA. And last but not least. I had to get the Dell A09 version of 6GBPSAS.fw to fix the card after everything was done. The motherboard you try this in has a BIG effect on whether it works or not. 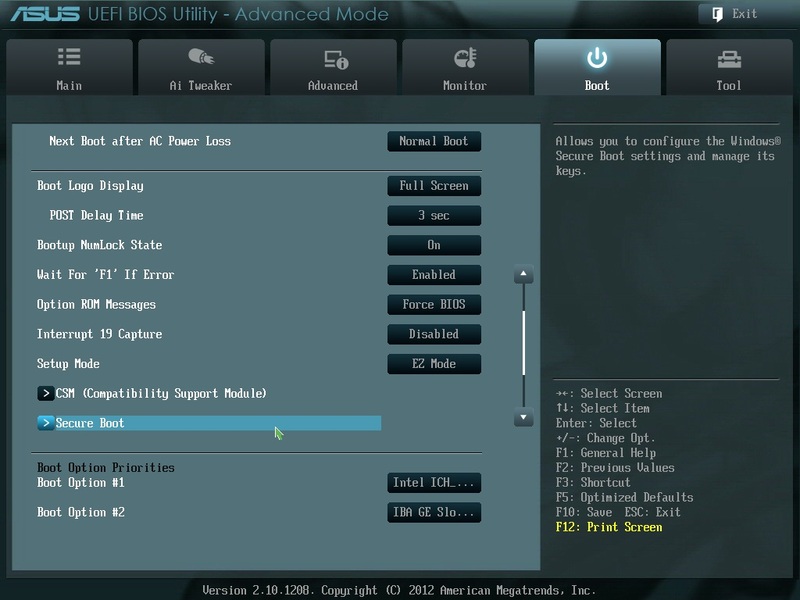 I could NOT get this process to work under ANY EFI-based motherboard with LegacyOptRom support. I got PAL errors up the wazoo. I had to use a pc that was bios based; and NOT an Intel reference board. Even with the B5/6 tape trick, I couldn’t get the Intel motherboards to boot. At that point, the card read as an actual LSI 9211-8i with p17 firmware on it, but there was a problem. The A port stopped functioning, which reduced my card to 4 drives available! I ended up reversing the process to go back to the Dell HBA firmware, and I got the A socket back, but then found out Drive A-0 wasn’t being detected as well. Turns out my card is faulty, which is why it was being sold. With the headache that I’ve had trying to make this thing work, I’m not sure I want to try with my new H310 card coming. I think I’ll just stick with the preloaded fw and just delete the boot rom. Thank you so much for this detailed how-to. Just flashed 2 cards to IT mode without any problems. Thanks for the write up, it is very instructional. I am getting an error in the UFEI prompt about not being able to flash an it over an ir firmware. I see some other people have had this problem, and you mention that the old version of sas2flash.efi should prompt for this. I am using the tools from the zip file on page one, and I am not getting a prompt. 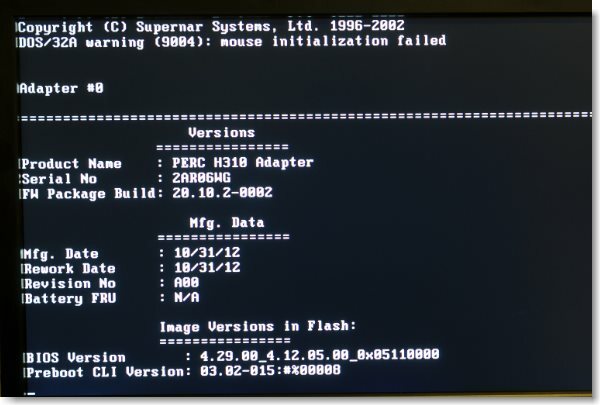 I get the same error from sas2flash-p17.efi, which I guess is the updated one and which you mention you expect would not be able to flash the it over the ir. Is using an elevated prompt in windows the only solution? I am doing this on a linux build and don’t have a windows install on this machine. Sorry for the late reply. I’ve been away for a while. Typically this error is caused by some step being missed. Usually flashing the Dell SAS HBA firmware. 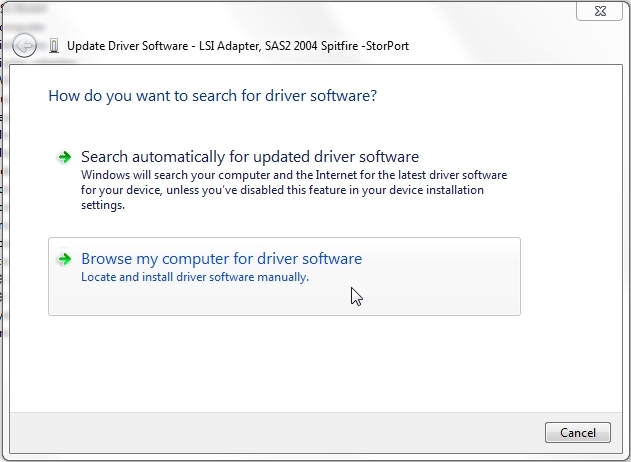 I’m guessing you’ve found a resolution by now but you can try following the steps in this video post: https://techmattr.wordpress.com/2014/07/14/the-dell-perc-h310-to-lsi-9211-8i-it-video/ with the updated zip file. It has some better tools and you can follow step by step with the video. The video quality is poor so I appologize for that but it should help. Wen’t back to P19 and everything is fine. One huge caveat with these procedures; if your Dell server happens to have an H700 card in addition to the H200, then the “megarec -cleanflash 0” command will brick the H700 card. 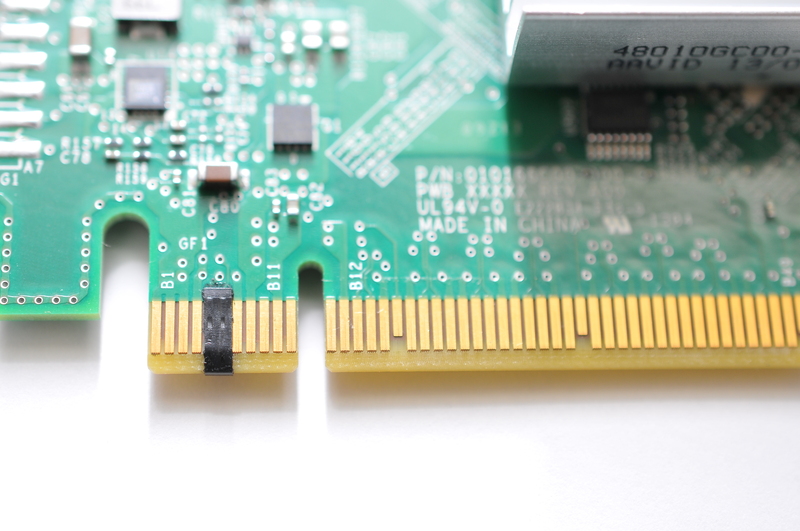 I recommend removing any LSI-based RAID cards (like the H700 and H800) before trying this. Hi I am facing some problem while installing 9211-8i with SAS HBA crossflashing or flashing to IT mode on Intel Desktop DH87MC Motherboard. after this i get an Error message http://www.rsifpl.com/data/error.jpg which i am not able to understand. Have you already read this post? in the “LSI-9211-8i.zip” there is the P12 version only, which do not permit IT over IR “cannot flash it firmware over ir firmware” !!! The newer post with the video has an updated ZIP file with a ton of useful tools as well as all legacy versions of sas2flash. I need to updated the steps here soon and I’ll probably publish a new how post instead of editing the old one. Thank you gab.lau for P5 efi version which did the trick with my h200! Thank you mattr & others for making the guides and bundle of the tools needed! After following your steps I managed to get my H310 flashed to LSI 2118it.bin but when checking the adapter details using the list command it does not show the firmware product id with (IT) at the end like in your video. Is this something that can be overlooked or do I need to do something different? I had the same “problem”. Older version of sas2flsh.exe didn’t show product id with (IT). Newer version does show (IT) version. My Dell Perc H200 has a green LED on the top that blinks on and off when powered up. Is this expected? It is expected. It just means the ports are connected. Thanks! And it should blink on and off every second or so the entire time its powered up? For guys like me who stuck with “cannot flash IT over IR” in UEFI: just flash from Windows command line using sas2flash-x64-p7.exe. I’ve got Windows 10 installed, but you can try doing it from Windows installation media (WinPE). Bet it’d work. I booting my desktop into DOS mode to do the step. all related FW getting from LSI avagotech. I also tried to cover P5-6 pin and can boot on non-Dell machine, that is amazing!! But fail to flash LSI fw for my desktop to use. Do you have any suggestion or idea whats going on? Major issue when execute “megarec …..” it claims No adaptor card was found…” Thanks for your kindly help! 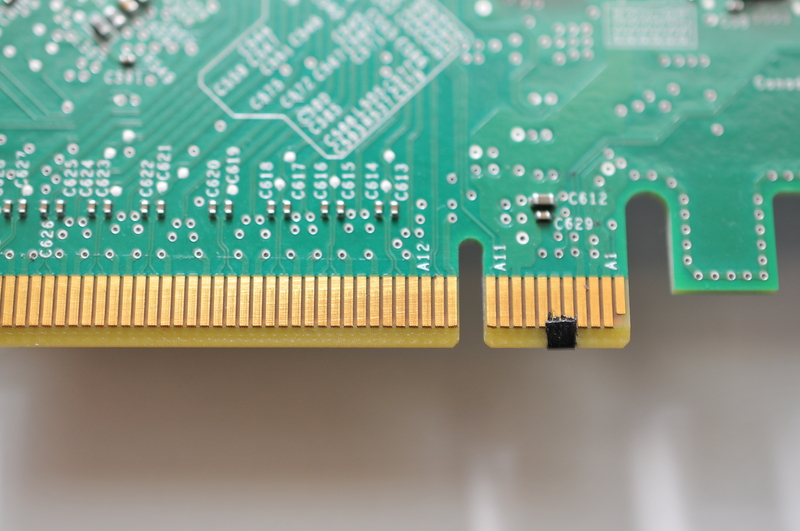 The Perc H330 is a LSI SAS3008 based card so SAS2008 cross flashing methods will not work. did you ever succeed in flashing the H330? As you can see i assume Mini Mono is the same chip and after I flash it and deep dive then i realize what happen. There is most likely a way to recover the card but since I don’t have one I can’t really do any testing with it. I’ve added a warning for people with those cards to not use these steps as several people around the webs have had issues. 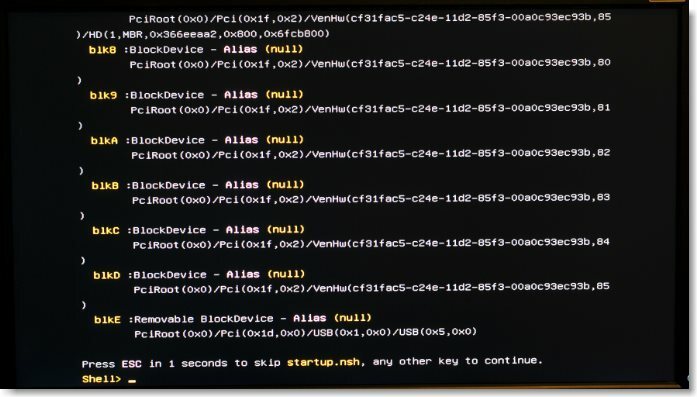 On a Windows 10 I cannot get the driver to say StorPort. Will this do ok? 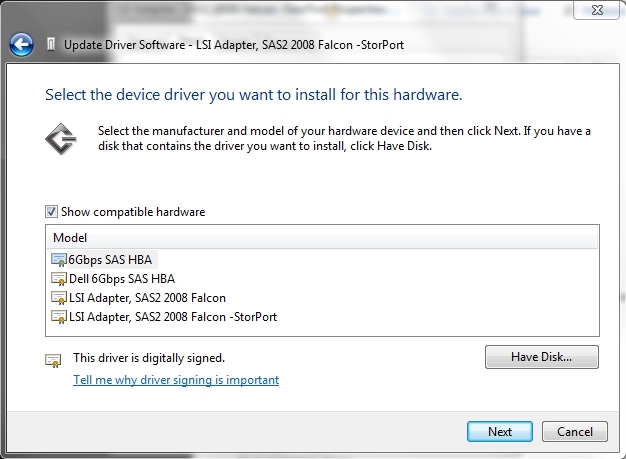 Or what should I do to get the driver to say StorPort? Check the event viewer for errors. If it’s clean then I wouldn’t worry about which driver you’re using. Thank you so much for this! I thought I had bricked my H200 using another method I found elsewhere, but I was able to recover and update to the latest firmware with these excellent instructions. If you’re ever in Rhode Island I’ll buy you a beer.